Our stock lanyards are available in three colours and sizes. Blue, red and black polyester in widths of 4mm, 1cm and 2cm. All with safety release and standard dog clip. Tubular or flat polyester can be screen printed with logos or branding. Flat weave nylon has a smoother surface allowing more complex reproduction. Ultra smooth polyester can be printed using a dye sublimation technique, to reproduce images to a photographic quality. 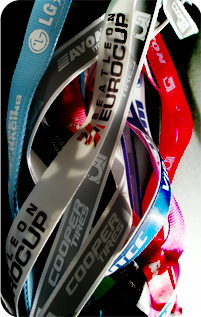 Your message can be woven into the very fabric of the lanyard to give the perception of exclusivity. A satin strip can be screen printed, or a polyester strip can be woven, then stitched onto a flat polyester lanyard (apliqué).